Surrounded by the northern fringe of the Vindhyan ranges, Bhimbetka lies 46 km south of Bhopal. In this rocky terrain of dense forest and craggy cliffs, over 600-rock shelters belonging to the Neolithic age were recently discovered. Here in vivid, panoramic detail, paintings in over 500 caves depict the life of the prehistoric cave dwellers, making the Bhimbetka group an archaeological treasure, an invaluable chronicle in the history of man. Executed mainly in red and white with the occasional use of green and yellow, with themes taken from the everyday events of aeons ago, the scenes usually depict hunting, dancing, music, horse and elephant rides, animals fighting, honey collection, decoration of bodies, disguises, masking and household scenes. Animals such as bisons, tigers, lions, wild boar, elephants, antelopes, dogs, lizards, crocodiles etc. 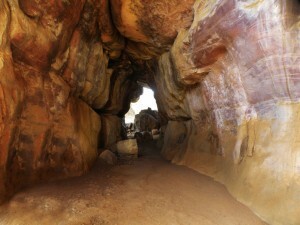 have been abundantly depicted in some caves. Popular religious and ritual symbols also occur frequently. The superimposition of paintings shows that the same canvas was used by different people different times. 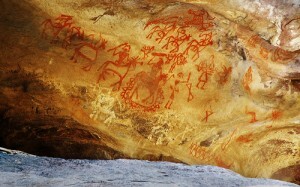 This entry was posted in Bhimbetka, Madhya Pradesh and tagged bhimbetka cave paintings, bhimbetka caves. Bookmark the permalink.